I reviewed Paper Ghosts: A Novel of Suspense (Ballantine Books) by Fort Worth's Julia Heaberlin for Lone Star Literary Life. "Accessorized with haunting black-and-white photographs, Paper Ghosts is top-notch suspense, a dangerous game of hide-and-go-seek, masterfully crafted." Nineteen-year-old Rachel disappeared on a sunny summer morning while riding her bicycle to a babysitting job. Twelve years later Rachel’s sister believes, after “dozens of interviews…hundreds of suspects…thousands of documents…reading, stalking, stealing,” she’s found the man who killed Rachel. Carl Louis Feldman, an internationally famous, award-winning documentary and fine-art photographer, is an elderly man, who may have dementia, living in a halfway house in Fort Worth after being acquitted of the murder of a Waco woman. Our narrator, name unknown until the penultimate chapter, tells the proprietor of the halfway house that Carl is her long-lost father so she can take him on a ten-day road trip across Texas, “from the gray beaches of Galveston to the existential desert town of Marfa and then back across the state to disappear into the Pine Curtain,” visiting gruesome landmarks where women disappeared or were killed, women our narrator suspects are Carl’s victims. She hopes to jar his faulty memory into revealing the location of Rachel’s body, so she can be properly laid to rest. Paper Ghosts: A Novel of Suspense is the fourth psychological thriller from award-winning Texas journalist Julia Heaberlin. Her last novel, Black-Eyed Susans (Ballantine Books, 2015), has been optioned for film by Rod Lurie and Voltage Pictures. 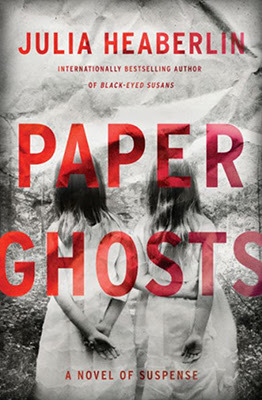 Accessorized with haunting black-and-white photographs, Paper Ghosts is top-notch suspense, a dangerous game of hide-and-go-seek, masterfully crafted. Heaberlin conjures a foreboding atmosphere of exquisite tension. Paper Ghosts is an evenly paced, intricately plotted original conception, with plenty of twists to keep us guessing. “I know what I’m worried about,” the narrator thinks. “I know the laws I’ve broken, the snakes I’ve poked. But who does Carl think is following us?” Clues are dark, thin threads in a tangled bird’s nest; this is a mystery requiring your attention. Paper Ghosts moves between the present and our narrator’s anxiety-ridden childhood and her obsessive search. She’s literally trained with a shadowy character she discovered on the Dark Web to overcome her many fears, both real and imagined. She would make a great recurring character or the star of a series, like Taylor Stevens’s Vanessa Michael Munroe, with whom she has much in common. Given the limitations of first-person point of view, we readers know only what the narrator knows, but we don’t know if she’s reliable. Ultimately the narrator finds herself in league with Carl, which she resists, the relationship reminding me weirdly of Paper Moon (Paramount Pictures, 1973). Paper Ghosts is emotional pinball, and Heaberlin is the wizard.